Did you know that compared to other form of orthodontic treatment, an Inman Aligner cost UK residents significantly less than other orthodontic treatments such as Invisalign Manchester? This is good news for those who choose it over its counterparts, but what exactly is it? Inman Aligner braces are primarily used to straighten the upper and lower front teeth when they're either overcrowded or crooked. The ideal patient would be one that has worn braces in the past and no longer wears retainers, meaning that their front teeth have started to shift and crowd once again. An Inman Aligner UK offers an accelerated orthodontic solution for those who don't wish to go down the route of full braces. They consist of a coiled spring that sits at the back of the teeth and a thin metal bar that's positioned across the teeth at the front. Unlike Invisalign or other forms of clear braces, Inman aligner braces are slightly visible when you smile. They're specifically designed to straighten front teeth in just a few weeks. They do this by applying continual but gentle force to move the teeth back into their correct position. It's easily removable making it easy for the wearer to clean their teeth, eat, and drink. During a free consultation our team will talk with you about your dental requirements and put together a treatment plan so you know exactly what to expect. Then you'll be measured up for an Inman Aligner UK to ensure a perfect and comfortable fit. Also during this time photo's are taken of your mouth and teeth so that a mould can be made. The details are them passed on to a laboratory where your bespoke Inman Aligner braces are made. 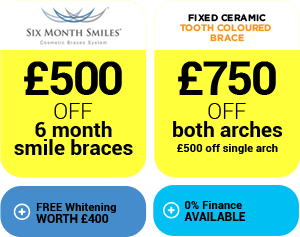 Finally you'll be asked back to the practice to have your braces fitted. Like all braces an Inman Aligner can take a little getting used to. However in most cases patients quickly adapt and find that after a while they don't even notice them. Patients will also have to wear their aligners for at least 20 hours a day for optimum effect and are expected to attend regular visits to the clinic to check progress. Unlike Invisalign Inman Aligners are not a comprehensive orthodontic solution. Instead they concentrate solely on correcting crooked or overcrowded upper and lower front teeth. Although they are easily removable for cleaning purposes they don't need to be removed every time you eat or drink. Finally, only one aligner is needed throughout the treatment, unlike other systems where the brace is replaced every two weeks. If you want to find out more about an Inman Aligner, UK based Church Road Dental and Cosmetics have the answer. We're a highly skilled team of cosmetic and orthodontic dentists who know what it takes to give you back your great looking smile. Contact us on 0161 486 0743 or visit our website at www.cheadlehulmedental.com to make an appointment. We look forward to meeting you.